Are you confused about whether to use its or it’s? If you mean it is or it has, then use it’s. If you mean anything else, use its. For more information about using it’s and its correctly, read on! Usually I focus on vocabulary and conversational English in these podcasts. But even if you’ve got an impressive vocabulary and are an amazing conversationalist, you’ll still look like a total dork if you make careless grammar mistakes in your writing. And by “mistake” I mean things that are errors by anyone’s definition of standard English, not contested usage points where expert opinion is divided (for example, the serial comma). Some grammar mistakes are surprisingly frequent even among educated native speakers of English. When it comes to written English, a lot of these mistakes involve words or phrases that sound the same but are spelled differently. Usually these mistakes are obvious when someone points them out to you, but when you are busy focusing on what you’re trying to say rather than worrying about grammatical accuracy, it’s easy to let the sound you hear in your head trick you into writing the wrong form. Unfortunately, if you make this kind of mistake, you run the risk of making a really bad impression with your writing. But luckily, some of these mistakes are really easy to fix if you just know what to look for. One of the most notorious of these grammatical pet peeves is when people write the wrong form of its/it’s. That’s what I will try to help you with today. This may be a bit difficult to follow if you are just listening, so I suggest you go to the website and have a look at the transcript. Its/it’s has two forms. One form has an apostrophe, spelled I-T-apostrophe-S, and is a contraction of it is or it has. 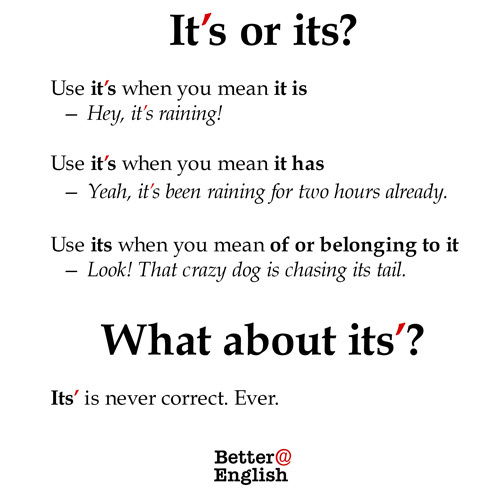 Confusing it’s and its is one of the most common grammar errors. But the rule is simple and the mistake is easy to avoid. The other form of its has no apostrophe, it’s spelled I-T-S, and is the possessive determiner used to designate animals and things. 1) Sweden is famous for its social welfare system and hot blonde chicks. 2) Volvo is famous for its boxy-but-safe car design. Neither of those sentences would make sense if you replaced its with it is or it has. Luckily, when you are speaking nobody can hear whether or not your brain is putting in apostrophes where they don’t belong. Writing is where you will get in trouble. Here is how you can avoid writing the wrong form of its/it’s when you have an important piece of writing where you cannot possibly afford to look like a dork. 1) So here’s step one. When you write, ask yourself if the it’s/its you’re about to write means it is or it has. If it does, then you can use the it’s form WITH an apostrophe. If it doesn’t make sense, then you need the its form WITHOUT an apostrophe. Sweden is famous for its social welfare. Can you say, “Sweden is famous for it is social welfare” or “Sweden is famous for it has social welfare”? Nope, it doesn’t work, so you know you need its with NO apostrophe. Volvo is famous for its boxy-but-safe design. You can try “Volvo is famous for their boxy-but-safe design.” Yes, it makes sense! So you know that you use its with no apostrophe. 2) The second thing you should do is use the find feature of your word processing software to search for all instances of its (no apostrophe) and it’s (with apostrophe). For each instance you find, perform the it is / it has test or the his-her-their determiner test. If you take the time to do this, you will never risk turning in a piece of writing containing this dorky grammar mistake. Good luck! It’s been a lot of fun making this first grammar podcast for you. 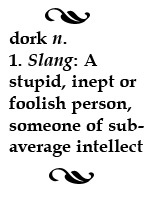 I hope you’ll find it useful for avoiding the dorky its/it’s mistake. This entry was posted in Advanced, Grammar and usage, Listening, podcast by Lori.